We are excited to announce that our founder and spokesperson, Astronaut Abby, will be speaking at the 2016 Humans to Mars Summit. This annual Explore Mars premiere event is being help May 17-19, 2016 at the George Washington University in Washington D.C. The speakers lineup on the first day of the event includes Astronaut Abby, Buzz Aldrin, Bill Nye, Andy Weir, Dava Newman, Charles Bolden, Ellen St0fan, James Green and many other esteemed professionals in the space and science community. The event is expected to exceed past events with an estimate of over 1,000 attendees and one million viewers online. We are proud to announce that The Mars Generation is partnering with Explore Mars (the event organizers) and through this partnership we are providing a special discount code for 15% off of Humans to Mars 2016 conference tickets for our community members. The discount code is TMGMars and can be used on all full event tickets. 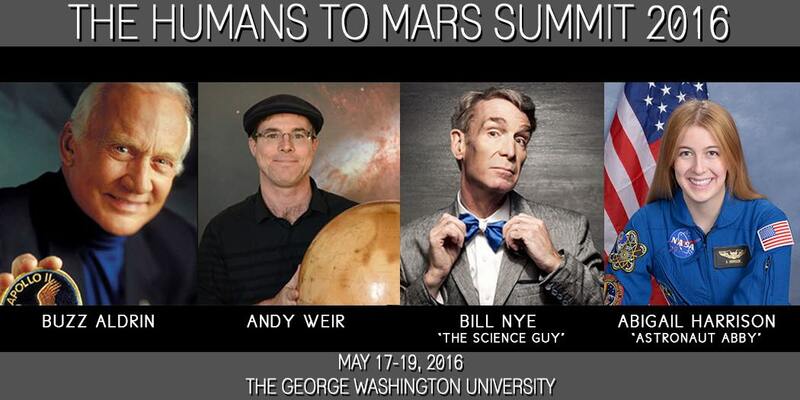 For more information and registration please visit the Human To Mars Summit website. We could not be prouder to have Astronaut Abby represent The Mars Generation at the summit and we hope those who are able will join us. Together we can change the world!